This week, Your News to Know rounds up the top news stories involving gold and the overall economy. Stories include: Gold party back on track thanks to recent comments from Janet Yellen, gold poised to move higher as Fed rate hike cycle continues, and collapsing pensions will fuel America’s next financial crisis. 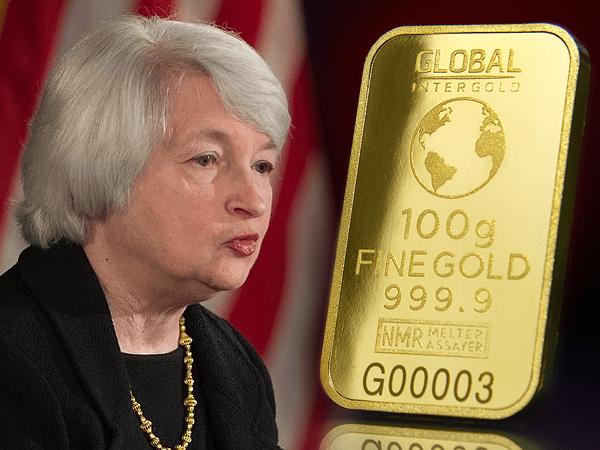 The gold rally, which slowed in March after two straight months of gains, now looks to be back on track due to the latest comments from Federal Reserve Chair Janet Yellen. Any concerns of the Fed raising rates at a faster pace than initially projected in December seem to have been alleviated after Yellen’s comments last Wednesday – her policy makers left the initial projection unchanged while Yellen promised that monetary policy will remain accomodative “for some time.” Futures already show the resulting shift in market sentiment, with the top three actively-traded gold options now being bets on further price gains. Last Wednesday, the markets watched closely as the Federal Reserve’s two-day meeting culminated as expected – a near-unanimous vote to raise interest rates another 0.25 basis points. The news immediately triggered a rally in gold and silver, with the yellow metal rising nearly 2%. Furthermore, computer algorithm based trades started selling the dollar and making purchases in the precious metals sector. As noted by Kitco’s David Erfle, the Fed’s main goal is to keep inflation in check. While the nominal five year yield sits at just over 2%, the real five year yield – also known as real rates – is negative at -0.03%. Erfle explains that gold prospers during periods of negative real rates, which now seem guaranteed – with core inflation rising to a five-year high since the election of Donald Trump, he believes that the Fed is unlikely to move ahead of the inflation curve. This will likely keep real rates in negative territory for years to come, in turn reestablishing gold as money and a store of wealth. Erfle reminds us that the Fed’s last interest rate hike cycle was nearly thirteen years ago. The cycle started on June 30th, 2004 with Fed funds at 1% and gold trading slightly below $400 – by May of 2006, when the Fed funds rate reached 5.25%, gold was trading above $700. With the latest cycle starting in December of 2015, a comparable gold move would be above $1,800 an ounce by the end of 2017. According to Erfle, the Fed and its new hike cycle have been instrumental in fueling the next leg of a multi-decade gold bull market. The next financial crisis in America could come from a place many are overlooking – an ever-shrinking pension fund that threatens to leave millions of Americans in the dry. MarketWatch contributor Jeff Reeves notes that Washington has a habit of painting an overly rosy picture while ignoring long-term financial issues – Donald Trump’s prediction of a 3% economic growth this year, when many economists are reducing GDP forecasts to 1.8%, is just one example. Social Security is another, as its trust fund is expected to run out of money by 2034. Reeves notes that several states can no longer ignore these problems. South Carolina’s government pension plan, which covers roughly 550,000 people, is $24.1 billion in the red – likewise, the Michigan Public School Employees Retirement System pension fund is $26.7 billion underfunded and has paid out more benefits than it has assets in 41 of the last 42 years. These problems stretch far past the government sector, as well. Some 100,000 coal miners are facing major cuts in pension payments and health coverage due to a nearly $6 billion shortfall in the plan for the United Mine Workers of America. One organization estimates that close to one million of working and retired Americans have pension plans that are at risk of collapse, with many more facing similar problems soon. The issue pours over to affect younger workers as well, as they are being asked to do more and more to support the pensions of retirees. A recent analysis states that South Carolina’s government workers and their employers have seen five hikes in their pension plan contributions since 2012 – most now contribute 8.66% of their pay compared to the 6.5% before 2012, and the trend will likely continue. As Reeves explains, these factors truly shape up to become a financial crisis when considering the reduction of purchasing power. Data from 2013 shows that the average expenses of someone older than 75 already exceed their average household income – a cut in benefits and a failure of an unsustainable Social Security to bridge the gap would reduce the spending of millions of pensioners. This would soon affect younger Americans as well, who face a tough job market as restaurants and retailers start cutting back. Reeves doesn’t think there is an easy solution in sight, as pension and Social Security reforms should be approached by a combination of benefit cuts, increased contributions and higher eligibility ages. All of these tend to offend stakeholders, however, and most politicians are unwilling to even consider tackling these issues. Reeves expects this to have serious effects on the American economy for decades.